Find out how to put an end to resource and revenue drains caused by manual purchasing and receiving processes. With web-based purchasing software, your organization can gain critical financial visibility and control that can ultimately improve your bottom line. 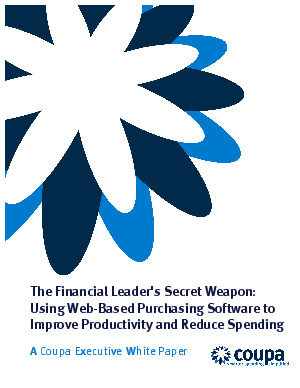 Written specifically for CFOs and financial decision-makers, this white paper from Coupa offers an in-depth look at the ways in which manual processing can negatively impact cash flow, and how web-based purchasing software resolves these issues. It also provides a comprehensive checklist of the key capabilities to look for when evaluating web-based purchasing solutions. Don’t let manual processes slow down your company’s cash flow. Download the white paper now to find out how you can bring financial performance up to speed with web-based purchasing software.